Aerobic exercises for seniors are used to become and stay healthier, stronger, and more active. 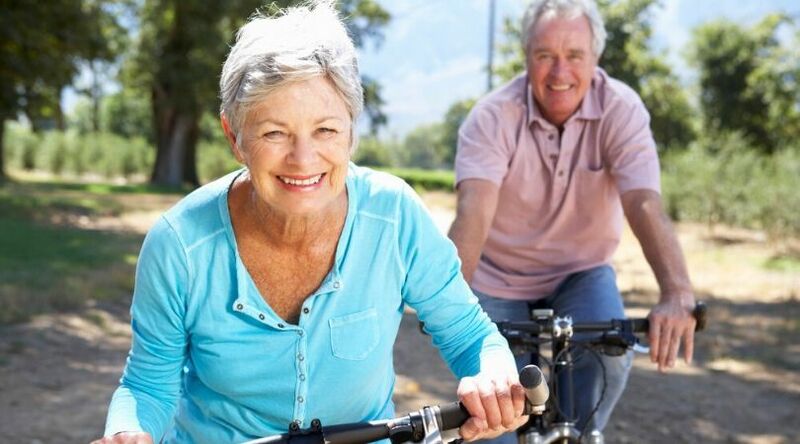 Furthermore, relatively intense aerobic exercises for seniors have positive physiological changes in their muscles. Finally, aerobic exercises for seniors are doable around the house. In addition, general information about exercises for seniors is available elsewhere. Also, other types of exercises, such as strength exercises, flexibility exercises and, balance exercises, are available to seniors. Walking is one of the most beneficial aerobic exercises for seniors. Take a walk in your neighborhood. Also, if you are just starting out with exercising, walk at a pace you are comfortable with and as long as you are able to. And, as you get used to the walking, increase the time and/or the intensity as described elsewhere. Furthermore time yourself to keep track of your weekly totals. And, if you live in a neighborhood where walking outdoors is not possible, you can: a) drive to a place where you can walk, b) drive to a health club or gym near you and use their treadmills, or c) purchase a walking treadmill so you can walk in the comfort of your home. Jogging is also one of the most beneficial exercises for seniors. First of all, go for a jog in your neighborhood. Also, keep track of how long you jog so that you can track your weekly totals. And, as you get used to the jogging, increase the time and/or the intensity as described elsewhere. Finally, if you live in a neighborhood where running outdoors is not possible, use the options described previously in the “Walking” section. First of all, a great aerobic exercise for seniors involves using a treadmill or elliptical machine. Also, a video on how to use the treadmill. And, here are the top 3 indoor treadmill running tips. First of all, drive to a health club or gym near you and use their exercise bikes. Also, buy an exercise bike and use it in the comfort of your home. Furthermore, the following types of exercise bikes are available: a) Recumbent bike, b) Upright bike or, c) Indoor cycle. And, if you like spinning, this video compares sitting versus standing on an exercise bike. Finally, this one shows the most important stretches after a spinning class. Also, swimming is also another one of those best exercises for seniors. First of all, you most likely have to drive to where you can go swimming. Also, keep track of how long you swim each time. And, as you get used to the swimming, increase the time and/or the intensity as described elsewhere. Furthermore, purchase a home exercise video and use it to get your aerobic working. Finally, dancing is also another one of those beneficial exercises for seniors. Most noteworthy, studies show that dancing strengthens the connection between mind and body. However, dancing will work for some people and not for others. Yet, it’s a fun way to get good aerobic exercise and maybe even sweat a little. Furthermore, most likely you will go dancing once a week. So mix dancing with other aerobic activities. In conclusion, to keep themselves healthy and strong, seniors regularly use one or more of the beneficial exercises for seniors. Aerobic exercises are an excellent way to be healthy and strong.